This light/lamp is perfect for young kids and it also has a tendency to bring out the eager young kid in everyone, regardless of age. 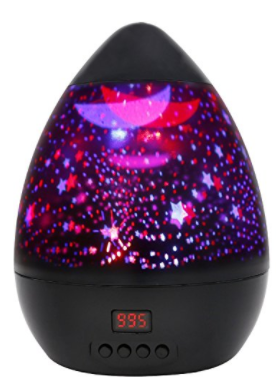 This rotating projector is an egg shaped ornament that can be used as a night light or if you want, it can bring the galaxy to your home. If you are fascinated by the night sky and want to live it in the privacy of your own home, this light/projector is the best option for you. It creates a soothing and relaxing environment and projects the night sky full of stars on to the walls of a room. It creates the illusion as if one was actually under the sky. The design of the projector is simple and easy to handle. It can be used whenever you feel like it or even to create a specific environment at a special occasion. So, you get to put on your own private viewing of the night sky and enjoy. Gere is here from Amazon!